This isn't about Russia, which during the 2012 presidential campaign he maintained "is without question our number one geopolitical foe,they fight for every cause for the world's worst actors." Romney was right in, and only in, spirit. As President Obama recognized at the time (and is still the case) the nation's number one geopolitical foe is terrorism. However, Russia may be our number one foe among state actors, and the former governor's emphasis upon the evil of the Kremlin was needed in a country still giddy over the end of the Cold War. President Obama might (and certainly should) want to forget that he rebuked Romney with "And, the 1980s are now calling to ask for their foreign policy back, because, the Cold War's been over for 20 years." Mitt Romney would not continue the new program that grants work permits and suspends deportation for two years for undocumented immigrants brought to the United States as minors, his campaign says, according to the Boston Globe. Romney would not revoke work permits for people who obtain them by the time he would take office, on Jan. 20, but he would not grant any after that, the campaign says, according to the Boston Globe report. 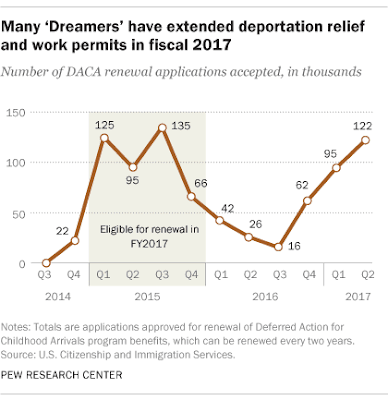 President Todd Schulte of FWD.us, a liberal/progressive immigration reform organization, notes "the federal government has the cellphone and home address of every DACA recipient." That's valuable information in the hands of one Donald J.Trump and Jefferson Beauregard Sessions III. By contrast, if Mitt Romney had been elected and ended the program, the information would be in the hands of a President Romney and whatever Attorney General he would have nominated. At the time of the GOP candidate's remark in October, 2012, 29 individuals would have been affected; now, close to 790,000. Nonetheless, Schulte accurately notes of the "Dreamers"
They grew up here, they work at nearly every major company in America, serve in the military and many are working on recovery efforts in TexasIf DACA is repealed and no permanent legislation passed, they will all be fired and our government will begin the large-scale deportation of people raised in the United States, using information they volunteered to the government with the promise it would never be used against them or their families. The President has put off a final decision for six months, during which time he hopes congressional Republicans will con Democrats into a deal in which the "Dreamers" are allowed to stay while Trump gets funding for a wall. Assuming the dreamer at 1600 Pennsylvania Avenue does not get his wish, Barack Obama may have won his bet, that whomever becomes #45 wouldn't revoke the Dreamers' privilege of remaining in this country. In that case, the President of the United States, enacted on an anti-immigration platform, will have reneged on a major campaign promise. That would be the right way to go because, as Mitt Romney understood in 2012, sometimes principle has to go out the window and you just have to leave well enough alone. However, if President Trump decides otherwise, those cellphone numbers and home addresses, courtesy of President Barack Obama, will come in quite handy for Trump-Sessions.